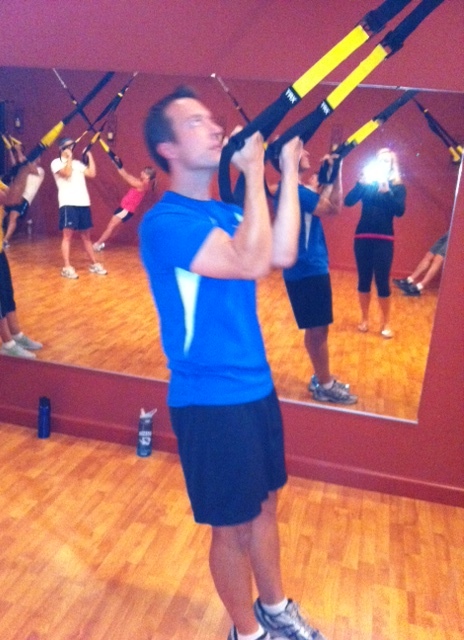 TRX training uses your own body weight as resistance in different exercises against an apparatus suspended from a ceiling. The TRX equipment is beautifully simple- it’s basically just adjustable straps with handles attached that can be used to perform dozens of different strength and core training exercises. The system was designed by a member of the US Military who wanted a very compact piece of equipment that could help him work out wherever, whenever. Everyone in the class learning the ropes. 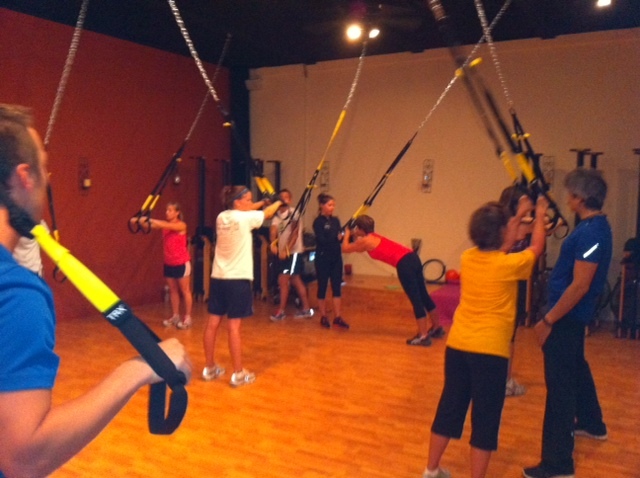 When my husband and I walked into the class at NuFit, I must admit I was a little intimidated by all of the TRX straps hanging from the ceiling, but I was quickly reassured by Kenji Freedman, a visiting TRX training expert. As I’ve come to expect from the staff at NuFit, we were greeted with a warm smile and assurances that we’d catch on in no time. 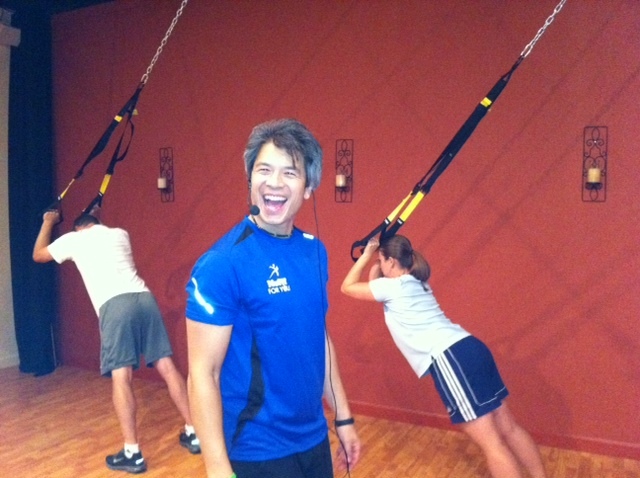 We took our positions and Kenji took over the class and explained the TRX Trainer. It couldn’t be easier to use. There are essentially 3 lengths you can adjust the TRX straps to; and all it takes to change the lengths is to slide a buckle up and down the straps. The buckle automatically locks in place wherever you stop. Kenji then demonstrated a few of the major positions you could stand to do the exercises, for example, a push-up position, a rowing position, and a curl position. Here I am trying the tricep press motion. This was a tough one! He must have seen the look on my face that said, “oh god… I don’t really do push-ups” because the next thing he explained is how you can increase and decrease the difficulty of each move. For example, in the push-up position, you can start by standing nearly vertical and do push-ups from there. You can try what I mean at home: lean against a wall and try a push-up from a near-standing position. Now do it with more angle. Get it??? Good. Well, I may be no good at push-ups, but I can take a little more than standing straight up, so I backed my feet up by two feet or so and did my set of push-ups with a little more angle. My husband (who is quite good at push-ups) went down to a much harder angle for his set. And that’s kind of the great thing about TRX. My husband and I have vastly different levels of upper body strength, but by using different angles with the equipment we could vary the intensity of the workout so effortlessly that we can be in the same class at the same time doing the same number of repetitions and still get a workout customized to our ability. Kenji was a fun instructor! The rest of the 30 minute workout just flew by. We tried each different workout position for a short time, took a 30 second break, and then tried another. I think the one that I liked the most was the bicep curl exercise (because I feel tough doing that one!) and the one that was the toughest for me was the Pilates-like plank push-ups. You must be wondering how I felt after the workout. Initially I was good, but the next day I was sore. I’d say it was a good kind of sore though. It helped me to realize that maybe all of my cycling has made my legs strong, but my upper body and core could still use some attention. All of the core work will certainly help me to be a better all-around athlete and adventurer, so it’s definitely something I’d like to try some more of. My husband absolutely loved it- he always likes this kind of thing- and he said it was a really challenging and fun workout. 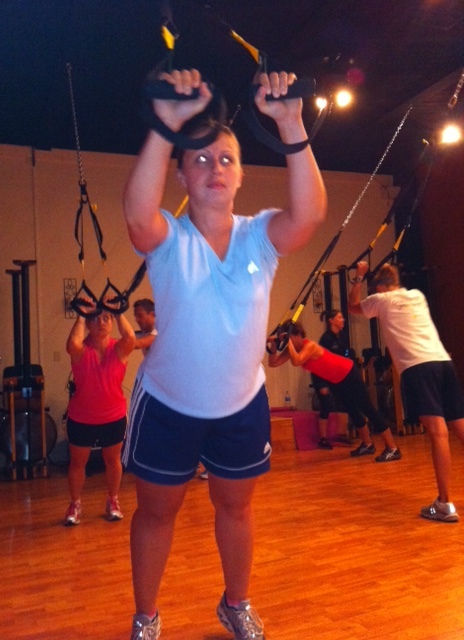 If you’re interested in trying TRX out, visit www.nufitforyou.com and check out their class schedule. If you haven’t been to NuFit before, your first class will be free! Also read about my very favorite NuFit class: CycleLattes! It’s time to get FIT at Legacy! FIT Class participants freestyle with different gym equipment. 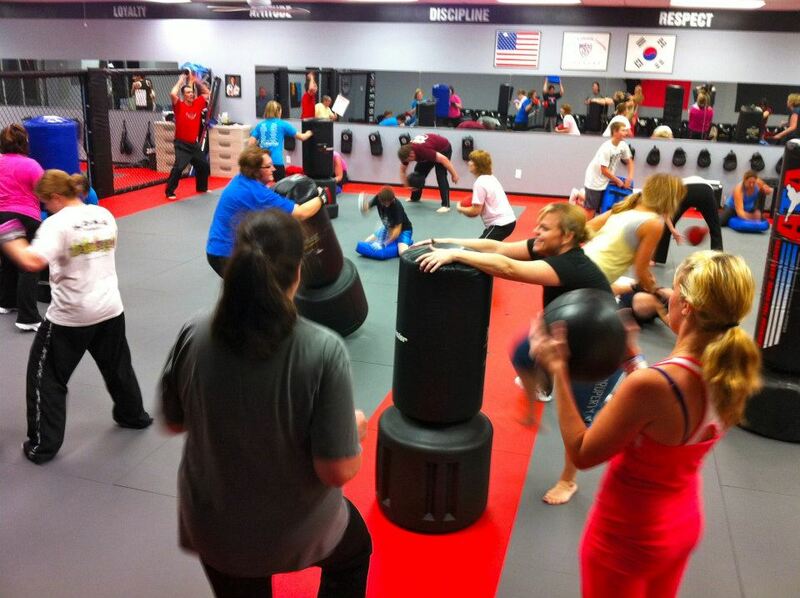 This week I had the great pleasure of going to Legacy Martial Arts Studio to try out a few classes. You might remember just a couple of weeks ago that I was at the studio with the local Army Drill Sergeants for a day of mixed martial arts training. The owner of the studio, Robert Bentley, invited me back to experience some of his regular programs and learn more about the facility. The studio is located in the strip behind Blockbuster Video at 36thand Broadway in Quincy, and it brings together some of the area’s best fitness classes for kids and adults. This week, I was able to try two classes: FIT Class and Jiu Jitsu. Jiu Jitsu is going to get a whole separate blog because I have a lot to say on the subject (such as: it’s awesome! ), but today I wanted to talk about FIT. 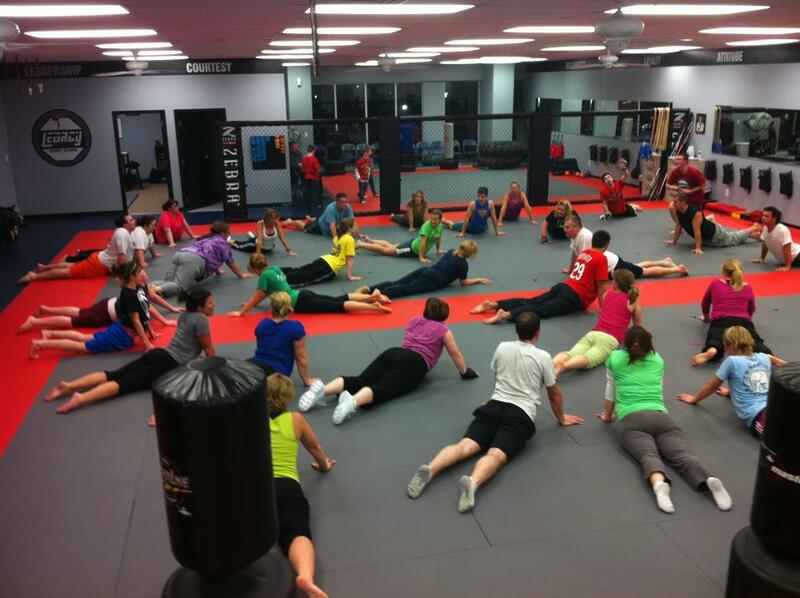 FIT class meets Tuesdays and Thursdays at 7:15 pm. Legacy’s FIT Class is a little hard to describe, because it’s designed to be different every time you go. It’s a fun, 45-minute class that will get you moving and make you sweat. The first thing I noticed when I walked in the door was the diversity of the group that was there. There were teenagers through adults, and people who ranged from super-fit athletes to people who were just getting started on fitness programs. Many of the people were there for weight loss, and others, like me, were there to add a cross-training component to their normal training schedule. The class started with a warm-up jog around the outside of the mat. Then Mr. Bentley announced that we were changing the jog to a high skip. I can’t think of the last time I skipped, but I defy you to skip anywhere without smiling. Skipping is a joyful movement, plain and simple. It also does a good job of getting your heart-rate up and getting you ready to workout with a good attitude. Brenda Turnbaugh cross-trains at Legacy. Brenda and I made our way through a variety of pairs exercises- short sprints, jumping jacks, tossing a medicine ball, a wheel-barrow race, and even a fireman’s carry challenge. We were both having fun the entire time and it’s easy to forget how much you’re working. One of the best moments in the class for me was the “Countdown Drill.” The Countdown Drill is where everyone does sets of 10 jumping jacks, 10 sit-ups and 10 push-ups, then 9 of each, then 8 of each, etc. all the way to 1 of each. I was one of the slower people in the class to do this drill, but when other people were done with their countdown, they would come over and join into my countdown until I was done too. Then we went to someone slower than me and did their last few sets with them until everyone was done. This spirit of camaraderie during this drill and other exercises made the class feel extremely welcoming and uplifting. “Mr. and Mrs. Bentley and the Legacy Family make you feel welcome and wanted. It doesn’t matter if you are a beginner just starting to exercise or a seasoned pro. Anyone showing commitment to their health is accepted with open arms,” explained Brenda. I couldn’t agree with her more. I’d highly recommend FIT class or any of Legacy’s classes for anyone who wants to start or enhance their training program. It’s fun, it’s different every time, and it’s a great workout. I can’t wait until next week to see how the workout changes! FIT Classes meet at 7:15 pm on Tuesdays and Thursdays. See below for a FREE week offer. Call 217-221-0700 for details. There are no session “starts,” you may begin FIT class at any time. I’ve got to admit I was skeptical about the workout craze of the moment. Zumba purports to be a dance party work out, and the first image that popped in my head when I read that description was Richard Simmons in a ridiculous outfit, hawking “Sweatin to the Oldies” VHS tapes on a late night infomercial. And to some extent, the Zumba craze is at least a little similar to aerobics fads of the past- but with a noticeable difference: It really is a tough, fun workout. The first thing I noticed at Zumba is the music selection. Zumba is known for its Latin-inspired beats and dance moves, but in the Quincy classes, they mix in other genres as well. Besides the Latin tunes, classes have featured songs by Prince, Gretchen Wilson, Micheal Buble, Lady Gaga, Whitney Houston, and many more. The mix of the music keeps the music fresh each class and offers something for everyone’s individual tastes. Next, I was surprised at how polished the class structure was. The well-trained and high-energy staff makes the hour-long class seem like the perfect hybrid of a night dancing at the club and a quality aerobic workout. The songs are picked in an order that maximizes their impact: first a warm up, then working to high intensity, coming back down for a song, another high intensity workout, and finally a cool down tune. The structure helps to make sure you’re getting your heart rate up into that max calorie zapping zone for as long as possible without burning yourself out. And since you’re using your own body weight as the resistance, the workout is automatically tailored to your individual needs. Maybe the most startling thing you’ll notice in a Zumba class is the broad appeal. The class I attended at the YMCA on Tuesday night had around 70 participants, whose age, experience and fitness level varied widely. Somehow, all of these very different people managed to have a good time working out together, and no one feels overwhelmed or bored. The energy in a Zumba class is simply magical, and it’s not uncommon for everyone to start “woo hooing” and clapping along with the music. It’s unscripted and totally addictive! There are dozens of Zumba classes offered in the Quincy/Keokuk/Hannibal area. The best way to see the complete listing is to go to http://www.zumba.com and click on “locate a class,” and enter your zip code. As with all activities listed on the Get Out Blog, make sure you check with a doctor before starting any exercise program!